I’ve been to Stratford Station a number of times now. I find it has a certain prison camp sort of feel to it I feel the urge to shoot it almost every time I pass through on the train. I would love to spend more time with my camera there but on the few occasions I have been in there with my Cannon I have been told by the guards that I am not allowed to take photos on the station platform. So while on the train (not on the platform) I could not help but get my phone out and take a shot through the window. 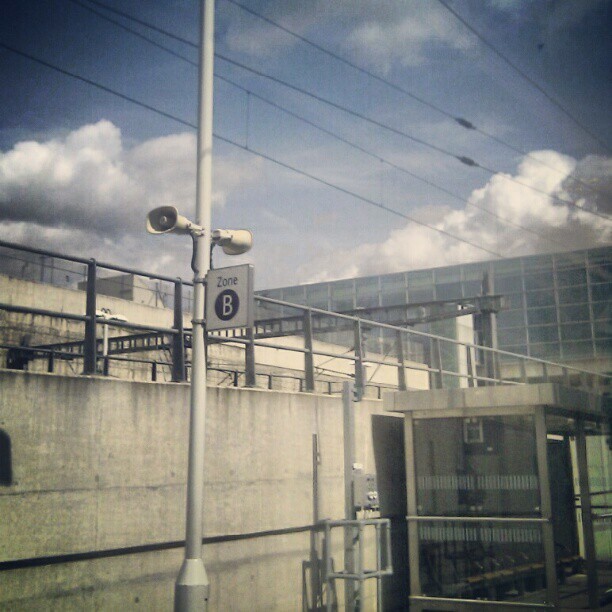 This entry was posted on Tuesday, May 15th, 2012 at 9:07 pm	and tagged with 2012 Summer Olympics, Canary Wharf, Digital, Digital camera, digital photography, Essex, London, Olympic Games, Photographer, Photography, Prison, Royal British Legion, Stratford Station, street photography, Train, trains, Transport, Travel and posted in digitaloskar, instagram, photography. You can follow any responses to this entry through the RSS 2.0 feed.